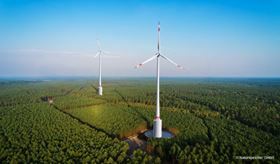 With the Naturstromspeicher, a wind farm can be turned into a highly versatile power plant. Naturstromspeicher Gaildorf is a natural energy storage plant that combines a pumped storage hydro-electric power station with a wind farm. The three reversible Francis machines from Voith will be a core element of the plant. If there is a surplus of power, the pumped storage power station switches to pumping mode moving water from a lower reservoir to the higher storage basin in the wind towers. If the demand for electricity in the grid rises, water is released from the upper basin to the bottom via a penstock and causes the pump turbines to move. Within seconds, electricity is generated and fed back into the electricity grid. Voith has been a strong partner in the project, contributing to the turbine development and adapting it to the special piping behaviour and the long penstock.